2017. Wow. We finally took our Christmas Tree down last weekend. Yeah, we drug it out as long as we could. How about you, Deni? Did you get your tree down right away, or hang on to it? We're always thankful that the reason for the Christmas season has very little to do with the media and retailer's hype, but with what should live inside of us. And we love sharing that. It's mid-January, and I'm already hearing success and failure stories. "I've almost finished my 30-day diet!" "I've only been to the gym 3 times." "I had my list of goals done before we rang in the New Year." "What's the point of setting goals I know I'll never achieve?" Question is: Which is success and which is failure? Zig Ziglar once said, “If you aim at nothing, you will hit it every time.” If you’re anything like me, you know from your own experience that he is right. Have you ever noticed that the general flow of human life tends to be toward ease and comfort? And when one day flows into the next, you never quite get around to turning your best intentions into reality. Those ‘good intentions’ you may perceive as admirable, may remain unrealized because they are too vague. Like moving targets…vague ideas are impossible to focus on and aim for! Do you have moving targets in your life, Deni? Let’s say you want to eat a healthier diet or lose the winter weight that is creeping or has crept upon you. Maybe you just want to establish a regular workout routine and stick with it this time. What would that look like for you? Without setting specific goals, your good intentions are exactly like that moving target. You would like to lose some weight, move a little better, make a change in your diet--but without clearly defined goals and methods (think actions steps), you can’t focus and make it happen. What specific tasks or movements would you like to accomplish comfortably? And once you start moving toward your goals, that is where momentum comes in. Wow. Just listen to the wisdom in his words. Sometimes, the hardest part of reaching a goal is just getting started. That first day of doing things differently or that first experience of bypassing an unhealthy treat in favor of a real food that will give you more energy can be daunting. It isn’t easy and it certainly isn’t always fun. So how do you get that momentum? How do you start moving? Enter Accountability! Having someone else involved in your efforts can be the most important factor in your success. It’s hard to change lifelong habits on your own. You need radical motivation that comes from within and involving others in your efforts. I call this radical motivation, your “why.” Setting deadlines, making commitments and entering contests all provide an external motivation. Understanding your “why” provides that internal motivation that you can always revisit. These two together will carry you through even the toughest temptations. Once you get started, you'll find that the momentum principle kicks in and it becomes easier and easier to keep going. You can make that moving target come to a screeching halt and blast the bull’s eye right out of it by taking a few minutes to write down what you want. Details, please. Don’t make your goals too broad or too hard. Be specific, and then begin brainstorming ways to get others involved with you. This will provide your sense of momentum. Success is within your reach. You can do this! Oh, and remember, Deni, I’m here to help you the entire way! 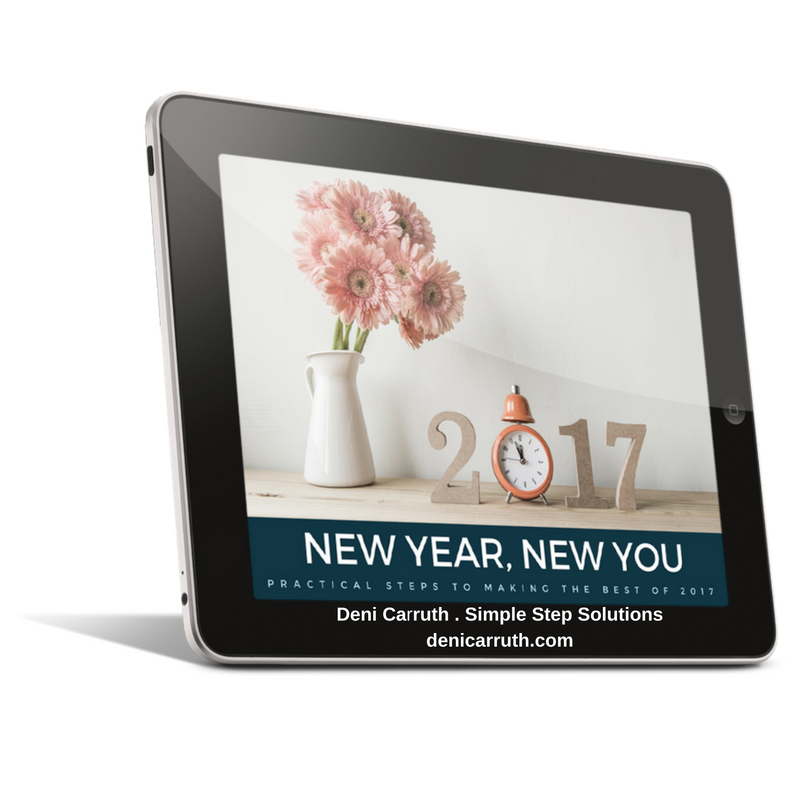 If you haven't gotten your copy yet, you can grab my Healthy New Year gift ebook: New Year, New You. It's full of really cool quotes, short content, and action steps for you to apply right away. I mean, what's a goal without simple steps and accountability, right? ;) Get yours now right HERE. And if you've already gotten your copy...how's it working for you? I'm so excited to announce my new coaching programs for 2017! Woo-hoo! I know! 2016 has been a year of me preparing and finalizing ways to serve you deeper and more efficiently. What that means for you is more online coaching available. Hey, I get it. We're all busy, not always able to head out for an appointment, constantly trying to simplify things....no, I really do get it. Me too! Time is a huge factor. And at the same time...so are results. So, more online coaching frees up some of your time, but my programs are going to deliver amazing results! Stay on the lookout for a big announcement on Monday of this week AND another free gift? I know! Who's here for ya...for real? And just so you'll know, the 2017 newsletters will be monthly to start. Your feedback will help me plan the frequency and the content. I want what you receive to be relevant, read and utilized. You may also receive special announcements in between, but only if they're awesome. Cool? Source: 1Tracy, Brian (2007-01-01). Eat That Frog! : 21 Great Ways to Stop Procrastinating and Get More Done in Less Time (p. 107). Berrett-Koehler Publishers. Kindle Edition.